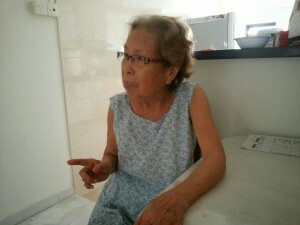 “My colleague and I went to visit her auntie who is 81 years old. She is very weak and frail, and is also suffering from Lupus and other medical conditions. My colleague has been praying for her salvation for a long time. After getting the auntie’s consent, I shared the bridge illustration from the book of life to her. After which I asked her if she would want to receive Jesus Christ as her Saviour and Lord. She paused for a while before answering with a reassuring “yes!”. We then led her in a prayer of repentance and then the salvation prayer. To our amazement, the auntie’s helper who was listening to our conversation indicated she would also want to know this Jesus! I illustrated to her the bridge concept too, and she accepted Jesus as her Lord and Saviour. Praise God for the 2 souls who have now walked into His marvellous light! Hallelujah! To God be all the glory!” AMEN! !